GuitarBot would fit right in to a band where only the instruments operate unplugged. Speaking of robot bands, don’t forget the LEGO-enabled Toa Mata, or the fully robotic group Compressorhead. MIDI is a great tool for virtually any musician. Unless you’re a keyboard player, though, it might be hard to use it live. [Evan] recently came up with a great solution for all of the wistful guitar players out there who have been dreaming of having a MIDI interface as useful as their pianist brethren, though. He created a touchless MIDI controller that interfaces directly with a guitar. 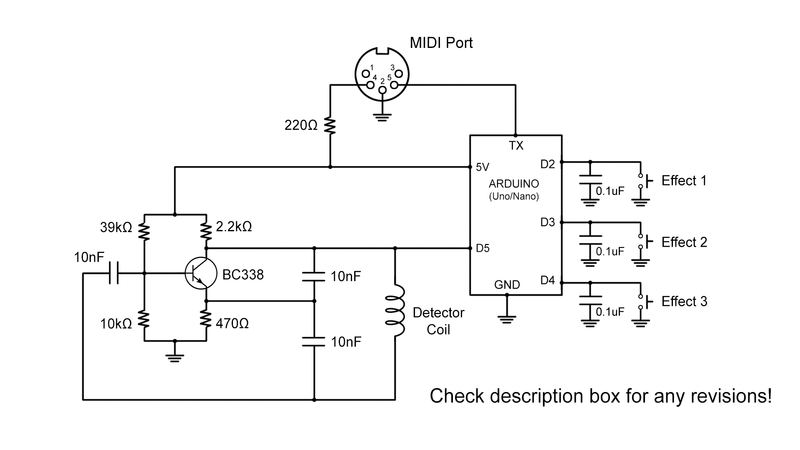 [Evan] set up an Arduino Nano to handle the MIDI interface to the computer. A detector coil from a previous project was installed onto the guitar can recognize how far away the guitarist’s hand is from the body of the guitar, giving the musician control over an effect of their choosing. The guitarist simply needs to be wearing a special mitten for use with the detector coil. [Evan] also added three tactile buttons, meaning that this MIDI usefulness can be extended to three different selectable effects. Be sure to check out the video below for a demonstration of how the interface works. [Evan] has also made the schematics and Arduino code available if you decide to build your own. This isn’t [Evan]’s first MIDI rodeo, either. He’s also created a MIDI drum interface from a Rock Band drum set, too. [fichl] plays electric guitar, and with that hobby comes an incredible amount of knob twisting and dial turning. This comes at a cost; he can’t change the settings on his small amp without taking his hands off the guitar. While larger, more expensive amps have multiple channels and footswitches, this tiny amp does not. Instead of upgrading, [fichl] came up with a device that turns his single channel amp into a completely programmable one, with just an Arduino and a handful of servos. The amp in question – an Orange Dark Terror head – has just three knobs on the front of the chassis, volume, shape, and gain. [fichl] had the idea of controlling these knobs electronically, and the simplest solution he came up with is cheap hobby servos. These servos are mounted in an aluminum box, and mount to the knobs with a few shaft couplings. The footswitch is the brains of the setup, with three buttons, four LEDs, and a DIN-5 output jack that delivers power, ground, and three PWM signals to the servo box. With the help of an Arduino Nano, [fichl] can change any of the knobs independently, or switch between twelve programmed settings. It’s an interesting setup, and something that could serve as a prototype for a much larger system on a much larger amp.